In November 2011, Mark Brewer was traveling through Douglas County, Nebraska, on his way to Los Angeles, California, when he was pulled over by a deputy sheriff for crossing lanes without properly signaling. Deputy Dave Wintle ran a background check on Brewer, finding that he did not have a criminal record. To be sure, Brewer, a disabled Air Force veteran who suffers from Posttraumatic Stress Disorder (PTSD), made mistakes during the stop. He denied having enough money to stay in a hotel, but a subsequent search of the trunk of the vehicle turned up $63,530 in plastic bags tucked inside two bookbags. Though no drugs were found during the search, Deputy Wintle claimed he smelled marijuana and found two articles related to making hash and cannabis oil. Brewer, who was unemployed and hoping his uncle, who lived in Los Angeles, would help him get a job, planned to use the money he'd saved since he served in the Air Force for a down payment on a home. He wasn't arrested, nor was he charged with a crime. He wasn't even given a traffic citation. But the deputy seized the cash under the suspicion that it was connected to drugs. Nebraska has better civil asset forfeiture laws than most states. The burden of proof is "beyond a reasonable doubt," which is the same standard needed to obtain convictions in criminal court. Once this standard is met, the property owner has to prove that the seized items are not connected to a crime. The profit motive is there, as law enforcement keeps 75 percent of the proceeds, but because the standard of proof is so high, there are not many examples of abuse under Nebraska's civil asset forfeiture laws. But a huge loophole in federal law allows state law enforcement to send seized property and cash to the federal government for "adoption." The Justice Department, through its Equitable Sharing Program, sends 80 percent of the proceeds from these forfeitures back to the seizing state or local law enforcement agency. The standard of proof is much lower, requiring the government to prove that the property is connected to drugs by a "preponderance of the evidence," which is a more than 50 percent likelihood of a connection. The property owner, who is often not charged with a crime, must meet a higher standard of evidence to prove that the seized items are innocent. Keep in mind that one the main principles of the American legal system is the "presumption of innocence." That is, every person who is accused of a crime is innocent until proven guilty beyond a reasonable doubt in a court of law. But, in federal civil asset forfeiture cases, there is a perversion of this principle. A forfeiture case is brought against the property, which is why, in these proceedings, the defendant is always listed as the item seized. 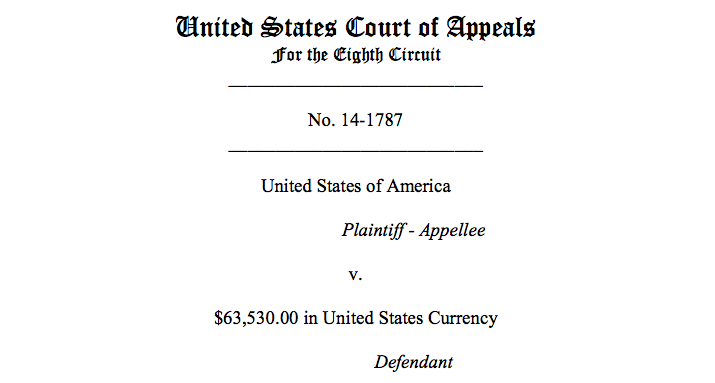 In this specific instance, the case is United States v. $63,530.00 in United States Currency. Brewer, who has been fighting the forfeiture proceeding in federal court since 2012, took his case to the Eighth District Court of Appeals. A three-judge panel, at the end of March, shot down his appeal in a decision that highlights how terrible federal civil asset forfeiture laws truly are. In an effort to prove his money was not connected to drugs, Brewer accounted for the origin of at least some of the cash. He also pointed to his disability, PTSD, and a distrust of the government to explain why he was evasive during the stop. The court, however, said that Brewer's statement "is merely an attempt to reargue the connection between the seized currency and drug activity," adding that "his testimony was uncorroborated and self-serving." Ridiculously, the court also argued against Brewer's claim that the seizure was an excessive fine prohibited by the Eighth Amendment. "Brewer has presented no evidence regarding the amount of the fine in relation to the crime it is designed to punish," the court said. "Instead, Brewer relies entirely on the argument that the forfeiture is necessarily an excessive fine because no drugs were found in the vehicle and he was never charged with any crime resulting from the traffic stop." Well, that's exactly the point. The seizure and forfeiture of more than $63,000 in cash was excessive and disproportionate precisely because he was never charged with a crime. If this forfeiture proceeding took place under Nebraska's jurisdiction, it is highly unlikely that a prosecutor could connect the cash to any illicit activity because the standard of proof is so high. That's why the Douglas County Sheriff's Department exploited the loophole in federal law, where the burden of proof is much lower, by send the cash to the Drug Enforcement Agency for adoption, allowing them to receive a substantial portion of the money back. The Eighth Circuit Court of Appeals ruled against Brewer, allowing the forfeiture to proceed. His last line of defense is the United States Supreme Court, where justices have upheld the legal fiction that property can be "guilty" of a crime. Congressional action to end the abuse of civil asset forfeiture may come too late to help Mark Brewer, who, for all intents and purposes, is innocent, but it could stop the government from corrupting the justice system in a way that prevents other innocent people from losing their property.